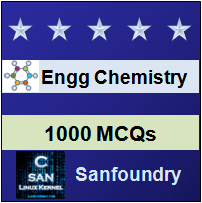 This set of Engineering Chemistry Multiple Choice Questions & Answers (MCQs) focuses on “Electronic Spectroscopy”. Explanation: The electronic spectra in the visible range span 12500-25000 cm-1 and in the UV region span 25000-72000 cm-1. 2. Which of the following transitions are of weak intensities and lie in the visible region? Explanation: n→n* transitions are of weak intensities and lie in the visible region. 3. Arrange the various electronic transitions in the order of increasing energy. Explanation: The correct order is- n→π* < π→π* < n→σ* < σ→σ*. 4. What is the position of the band of alkanes? Explanation: The position of the band of alkanes is ≈150 nm. Alkanes refer to any of the series of saturated hydrocarbons including methane, ethane, propane, and higher members. 5. Which of the following organic compound shows transition due to conjugation? Explanation: Conjugated dienes shows the transitions of low energy and is due to conjugation. 6. Which of the following is not an auxochrome group? Explanation: Auxochrome is the color enhancing group. –O2 is not an example of auxochrome. -OH, -SH and -OR are the examples of auxochrome. 7. Which of the following shift leads to the decreased intensity of absorption? Explanation: Hypochromic shift leads to the decreased intensity of absorption. Hypochromicity describes a material’s decreasing ability to absorb light. Hyperchromicity is the material’s increasing ability to absorb light. 8. Which of the following is an application of electronic spectroscopy? Explanation: Detection of impurities, control of purification, study of the kinetics of the chemical reaction, determination of molecular weight and determination of unknown concentration are the applications of electronic spectroscopy. 9. What will be the absorbance if %T= 80? 10. Which of the following is a limitation of the Lambert-Beer’s law? Explanation: Scattering of light due to particles, fluorescence of the sample and non-monochromatic radiation are some of the limitations of Lambert-Beer’s law. It relates the attenuation of light to the properties of the material through which the light is traveling.